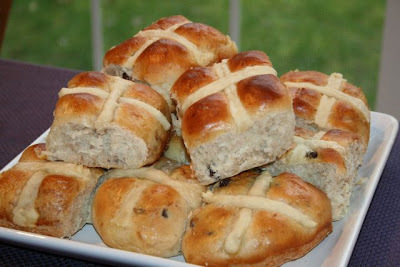 I served Hot Cross Buns for breakfast and posted the recipe at Catholic Cuisine. 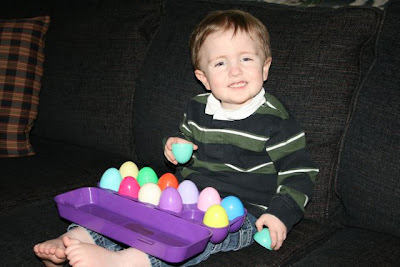 It was a rainy/snowy day and we spent the morning reading a few picture books including Benjamin's Eggs (Please read the comments regarding this book) . Snuggles didn't remember the Resurrection Eggs from last year and LOVED them. 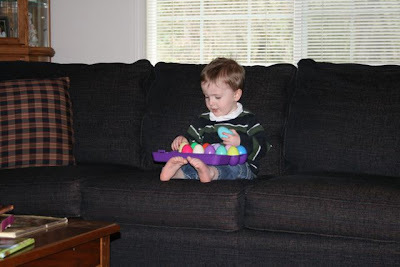 He sat on the couch opening and closing each one for at least an hour after we had finished reading the book. We were unable to attend Stations and the Veneration of the Cross at church, since my children were still recovering from the flu, so we prayed them (using The Way of the Cross for Children (DVD) ) at home. My children asked if Captain could hold the crucifix (like he does when he serves) and the rest could please hold candles while we prayed, so we did. We finished just at 3pm, and the candles were extinguished. Snuggles was very upset that he wasn't given a candle, and handed me a votive to light. I told him I was sorry, but that it didn't have a holder and so we couldn't light it for him. The smart little guy ran back to the kids bathroom, climbed up on the toilet, and brought me back one of the ones from a candle sconce I have hanging on the wall. I was impressed, I would have never thought to get one from there. 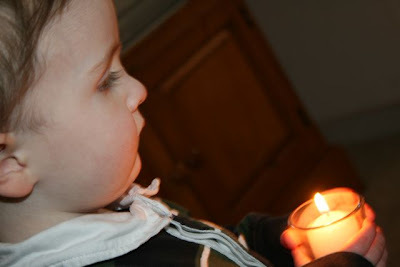 With lots of help and supervision, I let him hold a candle too. He smiled at me and then gave his siblings a very proud and triumphant look! He then proeeded to be very prayerful as we began to pray the Stations and the Divine Mercy Chaplet. 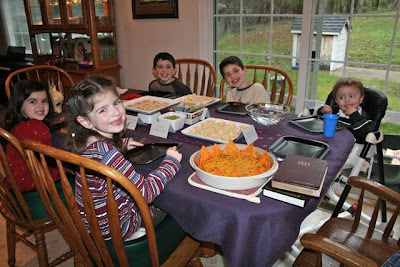 For our one main meal, we had another Lenten Tea for dinner. I bought my sticker calendar on clearance before I found your blog last year. I had a hunch the stickers would not last, so I copied them as a back up for laminating with intentions of using blu-tak as you mentioned. I removed, and placed back on original sheet. I also stored in original shipping envelope pressed between sheets of cardboard, and they've held up (no tears or curls this first year). I did however, decide to laminate Charlotte's sticker project. Using 4 sheets of white cardstock, which fit exact measurments of board, I taped them on back. I colored on front (marker outlines and light crayoned filling in). I cut up the sheets on the taped seams after coloring, and laminated. The pieces have to be reattached using clear packing tape, and the board folds up nicely to 8 1/2 x 11" dimentions. The kids are laminating their symbols after coloring, and using blu-tak. I'm not a regular crafter, so whenever I do something, I try to get as much use as possible out of it. I have trouble holding onto things if not functional, but hate to dump things too. I was disappointed when reading the book with our Resurrection Eggs that it so specifically says "we don't REALLY drink Jesus's blood, it's just a symbol." Guess I need to re-write something and paste it over that page! I just looked at my book and it says "But what did Jesus mean when he said the wine was like his blood and would be spilled..." I never noticed the word "like" and have probably subconsciously skipped over that? Anyhow, I think I will just cross out the word like. Then He said something that was hard for them to understand. He said that the wine in the cup was His blood. He didn't mean that they would actually be drinking blood, but that the wine was a symbol (or a picture) of His blood. Oh!! Yours IS much worse! And yes, after checking, my copyright date is older. It says copyright 1997 and revised 2008. Argh! That is sad that it was changed! I will have to go back to my Picture Book post and add a caution! Actually, I need to do an actual post pointing that out... I feel horrible for recommending it now!! So glad you were all talking about this. I just realized the word "like" in the text. I have a 1997 copyright copy. I'm thinking this is the perfect time to talk about it on my blog, since all of the Gospel readings this week have been about John 6! I will also talk about another book I love but has sketchy wording in it concerning the Last Supper (the Jesus Storybook Bible). thanks!